Shoestring 9/11: Why Did the Secret Service Leave the President and a School Full of Children in Danger in the Middle of the 9/11 Attacks? And yet, after arriving there shortly before 9:00 a.m. on September 11, Bush was allowed to stay at the Booker Elementary School until around 9:35 a.m.--almost 50 minutes after the first hijacked plane crashed into the World Trade Center and over 30 minutes after the second hijacked plane hit the Trade Center. He left the school just two or three minutes before a third attack occurred, when the Pentagon was struck. The Secret Service's failure to promptly evacuate Bush from the school is particularly baffling in light of the accounts of some key officials who were with the president that morning, in which these men recalled being worried that the school would be attacked. There were even concerns that terrorists might crash a plane into it. The failure to evacuate the school is also alarming in that it left hundreds of people there--not just the president--potentially in danger. It would be wrong to attribute the inaction of the Secret Service to incompetence. Agents who were in Sarasota for Bush's visit to the city were highly skilled individuals. They arranged extensive security measures for the visit, and they acted with great urgency and professionalism as they protected Bush after he left the school. They appear to have only failed to adequately protect the president for a period of about 40 minutes in the middle of the 9/11 attacks, after he arrived at the school. We need to consider, therefore, whether the inaction of the Secret Service at this critical time is evidence of something sinister. Could efforts have been made to somehow put the agents in Sarasota into a state of paralysis? They might, for example, have been tricked into thinking the reports they received about the terrorist attacks in New York were simulated, as part of a training exercise. The inaction of the Secret Service could in fact be evidence that, in contradiction to the official narrative of 9/11, rogue individuals in the U.S. government were involved in planning and perpetrating the terrorist attacks on September 11. His motorcade left the Colony Beach and Tennis Resort on Longboat Key, where he'd spent the previous night, at around 8:39 a.m. on September 11 and headed to the school. At 8:46 a.m., American Airlines Flight 11 crashed into the North Tower of the World Trade Center. Numerous people in the motorcade, including White House officials, military officers, and journalists, learned about the crash as they were being driven to the school. But no one called the president to tell him what had happened. The short speech was broadcast live on television and watched by millions of Americans. If any terrorists had been unaware of the president's location before then, if they were watching TV, they knew now. Bush only started to deviate from his schedule after he finished the speech. He was originally set to head out of the school at 9:55 a.m., with his limousine leaving there 10 minutes later and heading to the Sarasota-Bradenton International Airport. But due to the extraordinary circumstances, his motorcade left the school and speeded toward the airport at around 9:35 a.m. The fact that the president was allowed to stick to his schedule and stay at the Booker Elementary School for 40 minutes while America was under attack is particularly alarming since Bush's plans for September 11 were publicly announced four days in advance and had then been reported in the media. If terrorists had wanted to kill the president as part of the 9/11 attacks, therefore, they could have found out where he would be on September 11 and tried to attack him while he was there. 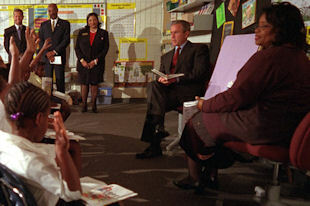 The failure of the Secret Service to promptly evacuate Bush from the Booker Elementary School in response to the attacks on the World Trade Center is also baffling considering that some members of his entourage believed at the time that the school might be attacked because of his presence there. Not only were some members of Bush's entourage concerned that the Booker Elementary School might be attacked, at least two key officials--Major Paul Montanus and Edward Marinzel--wanted the president to be evacuated from the place immediately after they learned of the second crash in New York. Montanus, the military aide who accompanied Bush to the school, apparently called for an evacuation after seeing Flight 175 crashing into the World Trade Center on television, at 9:03 a.m. Just after 9:00 a.m., according to the Sarasota Herald-Tribune, Sarasota County Sheriff Bill Balkwill was approached at the school by "a Marine responsible for carrying Bush's phone." This person was presumably Montanus, a Marine Corps officer. Montanus had heard that a plane had crashed into the World Trade Center, but little else about the incident in New York. He asked Balkwill, "Can you get me to a television?" Montanus's words should presumably have led to the president and his entourage being evacuated from the school immediately. "While the Secret Service is charged with protecting the president's actual body," Marist magazine explained, "it is the president's military aide ... who directs any evacuation" and the White House Military Office, which oversees the president's military aides, "that executes [the president's] safe passage." And yet no evacuation took place at this time. Why Bush was allowed to stay at the school after the second crash at the World Trade Center occurred, especially in light of the desire of Montanus and Marinzel to get him away from there, is unknown. A few accounts, though, describe people delaying his departure. The Secret Service is responsible for the protection of the president. Various accounts have indicated that this agency, more than any other, should have ensured that Bush was promptly evacuated from the Booker Elementary School when it became clear that the U.S. was under terrorist attack on September 11. The inaction of the Secret Service while Bush was at the Booker Elementary School in the middle of the 9/11 attacks stands out when we contrast it to the care with which the agency prepared for the president's visit to the school. Major Robert Darling, the White House airlift operations liaison officer who organized Bush's trip to Sarasota, described the preparations he initiated for the trip. He arranged to have "ﬁve hardened Secret Service cars, numerous pallets of communication gear, and more than 200 support personnel" flown to Sarasota "a full four days prior to the president's scheduled arrival." The Secret Service, though, acted as if it was in a state of paralysis after the president arrived at the school. It allowed him to stay there for 40 minutes and stick to his schedule as if nothing unusual had happened in the middle of a major terrorist attack. But then, at around 9:35 a.m., the behavior of the president's protective detail suddenly changed and Bush's agents finally acted with the kind of urgency we would reasonably expect under the circumstances. Their skill and professionalism were evident as Bush was taken from the school to the Sarasota-Bradenton International Airport, and onto Air Force One. The fact that the Secret Service was able to act with such care and skill in its preparations for Bush's visit to the Booker Elementary School, and in its efforts to protect the president after he left the school, rules out the possibility that its inaction while Bush was at the school was due to incompetence. Agents with the president for his visit to Sarasota were clearly highly capable professionals. Another thing to consider when examining the Secret Service's inadequate protection of the president on September 11 is the apparent failure of agents in Washington to alert their colleagues in Sarasota to the attacks on the World Trade Center. Edward Marinzel, as head of Bush's Secret Service detail, should surely have been notified about the attacks as a matter of priority, so he could initiate actions to protect the president in response to them. And yet Secret Service agents in Washington apparently failed to contact him about both crashes at the World Trade Center. If this was the first time Marinzel heard about the crash, it means he only learned about the incident inadvertently, rather than being contacted about it by a colleague. And it means he learned about the crash at least nine minutes after it occurred and at least six minutes after it was first reported on television. If Marinzel was alerted to the crash during the journey to the school, he therefore would surely have passed on the news to the president. But Bush was reportedly unaware of the crash when he arrived at the school, with the notification he received from Deborah Loewer being the first time he heard what had happened. It seems reasonable to assume, then, that no one contacted Marinzel and told him about the crash during the drive to the school. Subsequently, instead of being immediately alerted to the second attack, Marinzel only learned about Flight 175 hitting the World Trade Center minutes after the crash occurred. And rather than being informed about the attack by his colleagues in Washington, as presumably should have happened, he learned about it from Andrew Card. After Card walked across Sandra Kay Daniels' classroom and told Bush a second plane had hit the World Trade Center, Marinzel recalled, he "came over and whispered the same thing into my ear, and that was that we were under an attack." Since Card told Bush about the second crash at around 9:05 a.m. to 9:07 a.m., Marinzel must have only heard about it several minutes after it happened. Secret Service agents in Washington apparently also failed to promptly inform other agents in Sarasota, besides Marinzel, about the attacks. Kevin Kenney of the Sarasota County Sheriff's Office recalled that after he saw the "breaking news coverage" of the first crash at the World Trade Center on television, he "immediately made contact with detectives that were co-located with the Secret Service detail and informed them of the news coverage." "Remarkably," Kenney continued, the detectives told him "that they were not aware of the incident at that point." Members of the president's Secret Service detail would surely have immediately passed on the important news to the detectives with them if they had heard about the crash. The fact that they failed to do so presumably means they had not been contacted by their colleagues in Washington about it at the time when Kenney called the detectives. It is unclear whether Secret Service agents in Washington failed to contact their colleagues in Sarasota, besides Marinzel, about the second crash after it occurred. Certainly, accounts that are currently available make no mention of such contact being made. In light of the apparent failure of Secret Service agents in Washington to contact their colleagues in Sarasota about the attacks on the World Trade Center, it is worth examining in particular the actions of Carl Truscott, a key Secret Service official who was in the Eisenhower Executive Office Building, next to the White House, when the attacks occurred. As special agent in charge of the presidential protective division, Truscott was responsible for the overall security of the president. And yet there is no evidence that he made any attempt to contact Bush's detail while the president was at the Booker Elementary School. Truscott said in an interview shortly after 9/11 that he learned about the crisis on September 11 when he "observed the CNN broadcast of the aircraft crashing into the World Trade Center." (It is unclear from the report of the interview whether he was referring to the coverage of the first crash or the second crash.) But he made no mention of contacting Bush's detail in response to seeing the television coverage of the crashes. While it is alarming that the president was allowed to stay at the Booker Elementary School for 40 minutes while the U.S. was in the middle of a major terrorist attack, it is also chilling that no effort was made to evacuate anyone else from the school on September 11. If terrorists had attacked the place, hundreds of people there could have been killed or seriously injured. It is also strange that no one else, besides those who had come to Sarasota from Washington for the president's visit, ordered that the Booker Elementary School be evacuated. Remarkably, Wilma Hamilton, the superintendent of Sarasota County schools, refused to evacuate the school after being advised to do so. By allowing Bush to follow his schedule and attend the reading demonstration at the Booker Elementary School while America was under attack, the Secret Service left the president in potentially life-threatening danger. What went wrong? Why did agents perform so poorly in the middle of the worst attack on American soil since the attack on Pearl Harbor in 1941? Evidence described in this article gives rise to important questions about the actions of the Secret Service on September 11 that need to be addressed. Why, for example, did the president's protective detail wait for more than 30 minutes after the second crash at the World Trade Center occurred and it became clear that America was under attack before getting Bush away from the school? Why did the concerns of some personnel that the school might be attacked not lead to an immediate evacuation? And why did the Secret Service allow Bush to give a speech from the school that was broadcast live on television, thereby revealing his location to any terrorists who might be watching TV? Questions about the actions of other agencies and individuals who were with Bush in Sarasota need to be addressed too. For example, could someone other than a member of the Secret Service have ordered the evacuation of the president from the Booker Elementary School? The president's military aide was the person who would direct any evacuation of the president and the White House Military Office would implement the president's "safe passage," according to Marist magazine. Could Paul Montanus, Bush's military aide at the school, or a White House Military Office official such as Mark Rosenker therefore have ordered an evacuation? If they could, why did they apparently fail to do so after the second attack on the World Trade Center took place? Also, who was responsible for evacuating the other people at the school, such as the students and teachers? Why didn't that person order an evacuation? Why, in particular, did Wilma Hamilton refuse to send the children at the school home after being urged by White House security personnel to do so? Additionally, were any decisions made to evacuate the president that were overruled? No evacuation occurred after a U.S. Marine, presumably Paul Montanus, announced, "We're out of here" and asked, "Can you get everyone ready?" when he saw the second crash on television. Did someone overrule the Marine's apparent instruction to evacuate the president? If so, who was this person and why did they do so? Events described in this article also give rise to questions about the actions of some Secret Service agents who were in Washington at the time of the 9/11 attacks. Why, for example, did agents in Washington apparently fail to contact their colleagues in Sarasota about the crashes at the World Trade Center, to let them know what had happened and discuss what to do in response? Why did Carl Truscott, in particular, as the agent responsible for the overall security of the president, apparently fail to contact members of Bush's detail? Why did he only communicate with them after Air Force One left Sarasota? WAS THE SECRET SERVICE'S RESPONSE TO THE ATTACKS SABOTAGED? The Secret Service agents with the president in Sarasota appear to have been exceptionally skilled professionals, based on descriptions of their actions before and after Bush was at the Booker Elementary School. We consequently need to consider whether their inaction during the 40 minutes that Bush was at the school on September 11 was caused by someone, or some people, sabotaging their ability to respond to the 9/11 attacks. Might rogue individuals in the U.S. military and government have taken measures that prevented these agents from operating with the level of urgency they would usually exhibit in a situation where the president could be in danger? For example, could the agents have been tricked into mistakenly thinking that reports they received about the attacks on the World Trade Center were simulated, as part of a training exercise, and this was why they failed to react appropriately to them? Or were there rogue Secret Service agents involved with protecting the president who knew in advance what was going to happen on September 11? These agents could have known that the president and the Booker Elementary School were not targets, and so it was unnecessary to hurry Bush away from the school once it became clear that America was under attack. The failure of the Secret Service to adequately protect the president while he was in Sarasota could be strong evidence that rogue individuals in the military and government were involved in perpetrating the 9/11 attacks. Currently, though, only a limited amount of information is available about the actions of the Secret Service on September 11. Official investigations have failed to rigorously examine the suspicious behavior of agents in response to the terrorist attacks. This crucial aspect of 9/11 therefore needs to be thoroughly looked into as part of a new investigation of the attacks. "Bush Presses Education Agenda in Florida." ABC News, September 10, 2001; James Bamford, Body of Secrets: Anatomy of the Ultra-Secret National Security Agency. New York: Anchor Books, 2002, p. 636; "The Visit of the President to Florida, Monday, September 10-Tuesday, September 11, 2001." President of the United States, n.d.
 Bill Sammon, "Suddenly, a Time to Lead." Washington Times, October 7, 2002; Susan Taylor Martin, "Of Fact, Fiction: Bush on 9/11." St. Petersburg Times, July 4, 2004. White House transcript, interview of Director of Communications Dan Bartlett by Howard Rosenberg of ABC. White House, August 12, 2002; Leslie Bates, "Securing the Nation." Marist, Fall 2002; Dave Lance, "Born to Lead." Dayton Daily News, August 17, 2003; Richard Keil, "With the President: A Reporter's Story of 9/11." Rochester Review, Fall 2004. "Springfield Native Told President of Terrorist Attacks." Associated Press, November 26, 2001; David Priess, The President's Book of Secrets: The Untold Story of Intelligence Briefings to America's Presidents From Kennedy to Obama. New York: PublicAffairs, 2016, p. 240. Ari Fleischer, Taking Heat: The President, the Press, and My Years in the White House. New York: HarperCollins, 2005, pp. 138-139. Bill Sammon, Fighting Back: The War on Terrorism--From Inside the Bush White House. Washington, DC: Regnery Publishing, Inc., 2002, p. 42. 9/11 Commission, The 9/11 Commission Report: Final Report of the National Commission on Terrorist Attacks Upon the United States. New York: W. W. Norton & Company, 2004, p. 35; George W. Bush, Decision Points. New York: Crown, 2010, pp. 126-127. Bill Sammon, Fighting Back, p. 43. Ibid. pp. 50-51, 83; Scot J. Paltrow, "Government Accounts of 9/11 Reveal Gaps, Inconsistencies." Wall Street Journal, March 22, 2004; 9/11 Commission, The 9/11 Commission Report, p. 38. James Bamford, Body of Secrets, p. 633. Philip H. Melanson, The Secret Service: The Hidden History of an Enigmatic Agency. 2nd ed. New York: Carroll & Graf, 2005, pp. 330-331. Bill Sammon, "Suddenly, a Time to Lead"; Scot J. Paltrow, "Government Accounts of 9/11 Reveal Gaps, Inconsistencies." 9/11 Commission, The 9/11 Commission Report, p. 39. "The Visit of the President to Florida, Monday, September 10-Tuesday, September 11, 2001." Bill Sammon, "Suddenly, a Time to Lead"; 9/11 Commission, The 9/11 Commission Report, p. 39. "The Visit of the President to Florida, Monday, September 10-Tuesday, September 11, 2001"; "Remarks by the President After Two Planes Crash Into World Trade Center." White House, September 11, 2001; James Bamford, Body of Secrets, p. 636. Michael K. Bohn, Presidents in Crisis: Tough Decisions Inside the White House From Truman to Obama. New York: Arcade Publishing, 2015, p. 215. Bill Sammon, "'Right Decision.'" Washington Times, October 8, 2002; 9/11 Commission, The 9/11 Commission Report, p. 39; George W. Bush, Decision Points, p. 128. Dan Balz and Bob Woodward, "America's Chaotic Road to War." Washington Post, January 27, 2002; 9/11 Commission, The 9/11 Commission Report, p. 39. "Press Briefing by Ari Fleischer." White House, September 7, 2001. David DeCamp, "President Plans School Visit to Push Reading." Florida Times-Union, September 7, 2001; Mike Allen and Michael A. Fletcher, "Bush Campaign Aims to Put Education Plan on Fast Track." Washington Post, September 7, 2001. Mark Bowden, The Finish: The Killing of Osama bin Laden. New York: Atlantic Monthly Press, 2012, p. 3. Chad Binette, "Bush Will Talk Schools in Local Stop." Sarasota Herald-Tribune, September 7, 2001. "The President's Visit." Sarasota Herald-Tribune, September 8, 2001. Michael Morell with Bill Harlow, The Great War of Our Time: The CIA's Fight Against Terrorism From al Qa'ida to ISIS. New York: Twelve, 2015, p. 49. Garrett M. Graff, "'We're the Only Plane in the Sky.'" Politico Magazine, September 9, 2016. "Air Force One Pilot Mark Tillman and Senior Advisor Karl Rove." At Issue, KFDI, December 11, 2012. John Rogers, "Sarasota County Played a Pivotal Role in 9/11." WFLA-TV, September 11, 2013. Garrett M. Graff, "'We're the Only Plane in the Sky.'" "Air Force One Pilot Mark Tillman and Senior Advisor Karl Rove." Michael J. Morell, "11 September 2001: With the President." Studies in Intelligence 50, no. 3 (2006): 23-34. "A White House View of 9/11." LBJ Presidential Library, September 3, 2013. Michael J. Morell, "11 September 2001: With the President"; Michael Morell with Bill Harlow, The Great War of Our Time, p. 49. William Mansell, "Teacher Recounts Being at Booker With Bush on 9/11." Sarasota Patch, September 9, 2011. Derek Jenkins, "Derek Jenkins, EEB Classroom Teacher." Sarasota County Schools, n.d.
 William Mansell, "Teacher Recounts Being at Booker With Bush on 9/11." Tom Bayles, "The Day Before Everything Changed, President Bush Touched Locals' Lives." Sarasota Herald-Tribune, September 10, 2002; Dennis Dodd, "Navy Has a Higher Purpose Heading Into Notre Dame Game." CBS Sports, August 31, 2012. Leslie Bates, "Securing the Nation." "'We're Under Attack': Native Pittsburgher Escorted President on 9/11." WPXI-TV, September 7, 2011. Karl Rove, Courage and Consequence: My Life as a Conservative in the Fight. New York: Threshold Editions, 2010, p. 251. Bill Sammon, Fighting Back, p. 93. "737 Days After ..." University Press, September 17, 2003. "Frank Brogan Recounts His Moment in History With President Bush on Sept. 11, 2001." South Florida Sun Sentinel, September 11, 2011. White House transcript, interview of General Mark V. Rosenker, director of the White House Military Office, by CBS. White House, August 29, 2002. "Mission Statement." United States Secret Service, 2002. Office of Management and Budget, Annual Report to Congress on Combating Terrorism. Washington, DC: Office of Management and Budget, July 2001, p. 81. Inside the U.S. Secret Service. National Geographic Channel, October 24, 2004. Susan Taylor Martin, "Of Fact, Fiction." Philip H. Melanson, The Secret Service, pp. 330-331. Robert J. Darling, 24 Hours Inside the President's Bunker: 9/11/01 The White House. Bloomington, IN: iUniverse, 2010, p. 35. Tom Bayles, "The Day Before Everything Changed, President Bush Touched Locals' Lives." Derek Jenkins, "Derek Jenkins, EEB Classroom Teacher." Jennifer Barrs, "From a Whisper to a Tear." Tampa Tribune, September 1, 2002. Bill Sammon, Fighting Back, p. 25. Clear the Skies. BBC, September 1, 2002; "Air Force One Pilot Mark Tillman and Senior Advisor Karl Rove"; "A White House View of 9/11." "Air Force One Pilot Mark Tillman and Senior Advisor Karl Rove"; "A White House View of 9/11." Karl Rove, Courage and Consequence, p. 251, Karl Rove, Speech at the Reagan Ranch Center, Santa Barbara, CA. Young America's Foundation, April 30, 2010. Sonya Ross, "Flying With President Bush on a Day Terrorists Hit Hard." Associated Press, September 12, 2001; Michael J. Morell, "11 September 2001: With the President." Bill Sammon, Fighting Back, p. 99. Michael J. Morell, "11 September 2001: With the President"; Garrett M. Graff, "'We're the Only Plane in the Sky.'" Karl Rove, Courage and Consequence, p. 252. Dan Balz and Bob Woodward, "America's Chaotic Road to War"; 9/11 Commission, The 9/11 Commission Report, p. 39. Mark W. Tillman, "Air Force One: Zero Failure." Speech presented at the National Museum of the U.S. Air Force, Dayton, Ohio, February 29, 2012. "'We're Under Attack': Native Pittsburgher Escorted President on 9/11." Karl Rove, Speech at the Reagan Ranch Center, Santa Barbara, CA. Kevin Kenney, "... I Could See Air Force One Accelerate Toward Me and ... Takeoff. ..." Sheriff, September/October 2011. "Assistant Director Carl J. Truscott Announces Plans to Retire From the U.S. Secret Service." United States Secret Service press release, Washington, DC, April 1, 2004. USSS memo, interview with SAIC Carl Truscott. United States Secret Service, October 1, 2001; "USSS Statements and Interview Reports." 9/11 Commission, July 28, 2003. Untitled document. United States Secret Service, n.d.
 Michael J. Morell, "11 September 2001: With the President." Jennifer Barrs, "From a Whisper to a Tear." Scott McClellan, What Happened: Inside the Bush White House and Washington's Culture of Deception. New York: PublicAffairs, 2008, pp. 103-104. Mike Riopell, "Educator's History Lesson." Arlington Heights Daily Herald, September 11, 2006. You have gathered and analyzed an almost unbelievable mass of 9/11 information. When will your book come, with much of your analyses and conclusions presented in a nice integrated form?